This study suggests that student reflection on academic and industry collaborative projects can enhance student’s understanding on the design process to solve live industry problems. It contributes to the body of design literature to support students learning of explicit and implicit knowledge (Boling et al., 2016; Land et al., 2016; Salama, 2015). 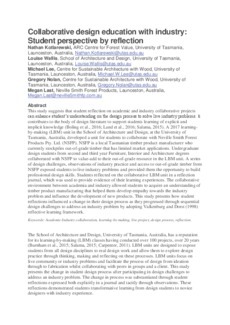 A 2017 learning-by-making (LBM) unit in the School of Architecture and Design, at the University of Tasmania, Australia, developed a unit for students to collaborate with Neville Smith Forest Products Pty. Ltd. (NSFP). NSFP is a local Tasmanian timber product manufacturer who currently stockpiles out-of-grade timber that has limited market applications. Undergraduate design students from second and third year Furniture, Interior and Architecture degrees collaborated with NSFP to value-add to their out-of-grade resource in the LBM unit. A series of design challenges, observations of industry practice and access to out-of-grade timber from NSFP exposed students to live industry problems and provided them the opportunity to build professional design skills. Students reflected on the collaborative LBM unit in a reflection journal, which was used to provide evidence of their learning experiences. The collaborative environment between academia and industry allowed students to acquire an understanding of timber product manufacturing that helped them develop empathy towards the industry problem and influence the development of new products. This study presents how student reflections influenced a change in their design process as they progressed through sequential design challenges to address an industry problem by adopting Valkenburg and Dorst (1998) reflective learning framework.